Evolve modern shape chair mats from Dimex | The only chair mats specifically designed for today's 5-star wheel base chairs. The familiar chair mat shapes on the market today were developed over 50 years ago, when pedestal desks were popular. The traditional rectangular lip fit the narrow opening for the legs, offering additional protection from wheel wear in that space. Over the last half century, as office chairs evolved from 3-wheel and 4-wheel bases to the more stable 5-wheel base design and pedestal desks evolved into more open modern style for the office and home, the advancement of chair mats got left behind..until now. Evolve modern shape office chair mats are the result of extensive research on how we move in our workspace relative to today's office chair and contemporary furniture designs. The wide tapered front lip and radius back corners of the mat work in concert with the circular footprint of the 5-Star wheel base to offer more efficient use of the rollable surface of the mat, keeping the wheels on the mat in most critical area where the lip meets the rest of the mat. Evolve patented designs bring chair mats into the 21st century. Replacing or repairing carpeted floors can be expensive! Protect your investment with a durable Evolve chair mat engineered to protect your low pile carpet from wear due to the wheels of your office chair rolling back and forth over time. Perfect for low pile carpet thicknesses of 1/4 in. or less. Tip: to determine the thickness of your carpet pile, place a penny edge down in the carpet pile (like measuring a tire tread). if Lincoln's chin is above the carpet pile, your carpet is 1/4 in. or less. 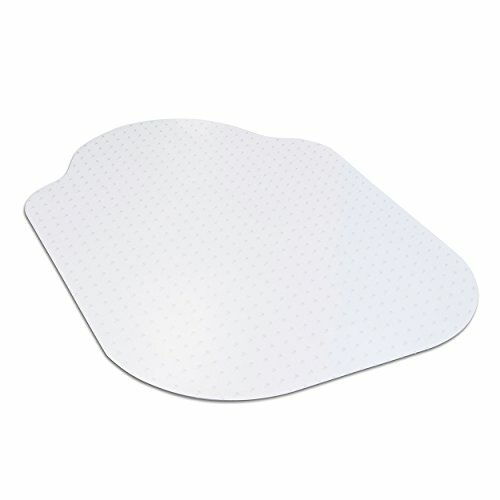 The only chair mat specifically designed for today's 5-star wheel base chairs. Features a wide tapered front lip and gripper backing to protect low pile carpet. Manufactured in the USA and Greenguard certified by UL. Ships flat in ISTA-3A approved packaging to eliminate warping, creasing and other shipping damage.